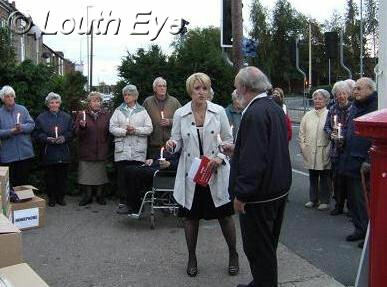 A crowd gathered outside Newmarket Post Office in Louth for a candlelit vigil on Monday, October 8th. 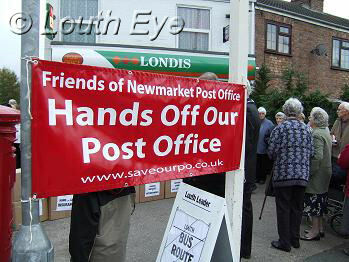 The Post Office is one of two in Louth that are earmarked for closure in the New Year. 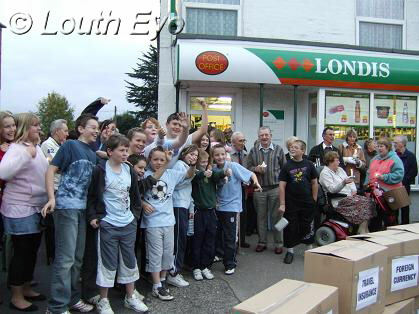 People are angry that Louth could lose this vital service. This move comes after the announcement that the number 41 bus service which serves the town is also threatened with cuts. The vigil was attended by the mayor, John MacDonald, and councillor John Hough. It also attracted the attention of a couple of local TV stations. Cardboard boxes laid out in front of the post office detail some of the different services it can provide, to emphasise the fact that this post office handles a lot more than just mail. Campaigners are urging people to get involved by writing to Adrian Wales, Network Development Manager, Post Office Ltd, c/o National Consultation Team, FREEPOST CONSULTATION TEAM. There is also a website for the campaign at http://www.saveourpo.co.uk/. 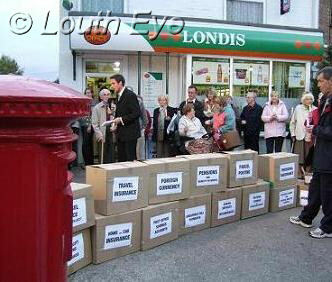 Campaigners stage a musical protest in the centre of town about the proposed Post Office closures.